1903 January 14 Earnock No 3 Lanark John Watson Ltd James White 31 Miner Falls of side Fall of head coal while sitting waiting for the fireman to come and fire a shot. The coal was not secured by props as it ought to have been. 1903 January 15 Arthur Fife Lochgelly Iron & Coal Co Ltd James Haxton 75 Pitwood sawer On surface  by machinery Deceased was ripping a piece of wood at a circular saw, when the saw caught it in some way and threw it violently forward, and it struck him in the abdomen. 1903 January 15 Denbeath Fife Bowman & Co Patrick Healy 21 Loco. Shunter On surface  railways, sidings or tramways The locomotive engine pushed part of a train of waggons into a siding off the main line, giving the waggons sufficient impetus to enable them to clear the crossing, and as soon as the waggons had passed into siding deceased who had held the points jumped on to the engine. The locomotive then returned on the main line, pushing the remaining part of the train in front, and on reaching the crossing the engine caught part of a waggon just where deceased stood on the footplate, fatally crushing him. The waggons in the siding had gradually moved back until the leading one fouled the crossing. 1903 January 21 Polton Fife Lothian Coal Co Mechelo Riso (Italian) 30 Waggon trimmer On surface  railways, sidings or tramways Deceased was standing between two waggons - probably taking shelter from a storm - which stood five feet apart, when two other waggons came down and striking the nearest sent it close up to the other, and fatally crushed him. A workman who saw deceased's danger shouted to him, but although he appeared to hear he stood still until the waggons collided. He could neither speak nor understand the English language. 1903 January 22 Kinnaird Kinross Fife Coal Co Ltd William Martin 48 Miner Falls of side Deceased was stamping a hole in the pavement to set a machine tree to bore a shot hole, when a small stone fell off the side and injured the thumb of his left hand ; blood poisoning supervened and he died on 5th February. 1903 January 23 Glenboig (Fireclay) Lanark Glenboig Union Fireclay Co Ltd Peter Mitchell (Pole) 21 Miner Falls of side Deceased was filling a tub with clay when a part of the overhanging face fell and killed him on the spot. 1903 January 30 Motherwell Lanark John Watson Ltd William Wilson 24 Bottomer Falling from part way down Deceased was bottomer at the upper of two mid landings. He had signalled away a cage containing a man who was descending to pit bottom, and as the same cage was re ascending he erroneously assumed that it was being brought back to him, prematurely raised the gate which fenced the shaft and pushed forward a loaded tub, falling with it to pit bottom, a distance of 40 fathoms. 1903 February 2 Busbiehead No 2 Ayr J & R Howie Laughlan Connolly 46 Miner Falls of roof Fall of roof at roadhead. Due to want of timbering. 1903 February 2 Lochhead Fife Wemyss Coal Co Ltd James Anderson 18 Miner Falls of side Deceased was taking down some coal at a ''nose " in a longwall working. A rance had just been drawn from it. but as the coal did not come away readily, he sat down and began to relieve it by deepening the holing. While so engaged the coal came away suddenly, causing injuries which terminated fatally. 1903 February 3 Whistleberry No 1 Lanark Archd. Russell John Russell 35 Miner Haulage  run over by tubs He is said to have gone in front of loaded hutch at the top of a "cuddie brae" to put it on the rails. He did not hook it to the rope, and when put on the rails it overcame and ran over him. 1903 February 5 Carberry Edinburgh Edinburgh Collieries Ltd Phillip Laing 33 Sinker Shaft accidents -things falling from part way down Deceased was a foreman sinker, and at the time of the accident was engaged removing a scaffold 7 fathoms below the Great seam, and the planks were raised to said seam by a rope and drawn up by two workmen. A plank was fixed to the rope in the usual way, and while being hauled up it slipped from the rope and fell, striking deceased on the head. The rope had not been properly fastened by deceased. 1903 February 6 Prestongrange Haddington Summerlee & Mossend Iron & Steel Co James Ritchie 14 Haulage assistant Other haulage accidents Deceased was attempting to prevent some tubs, which had been struck by a horse-rake, from fouling a crossing, when the leading tub left the rails and crushed him against a brick wall. From Main body of report: This accident occurred in the Upper Drumgray coal. The seam is worked longwall and has a moderate dip. The deceased and his brother worked on the back shift, and were alone in the section digging coal. During the shift deceased left his working place and proceeded to the road above to get some tools, and gas was ignited at his naked light. There had evidently been a large accumulation, as it took a search party several hours to get deceased's body owing to the large amount of after-damp. The explosion was very violent, the hurdles, screens, &c., being thrown down and damaged. The fireman made an inspection of the place in which deceased worked, but admitted he did not go to the place where gas was ignited. It was said that the speed of the fan had been reduced during the night, lessening the air current and allowing the gas to accumulate, but on inquiry this statement was not borne out. 1903 February 18 Bailliesmuir Lanark Coltness Iron Co Ltd William Allison 36 Miner Falls of side Deceased was holing when a piece of face stone fell upon him. 1903 February 19 Polton Edinburgh Lothian Coal Co Ltd John Davie 39 shaftsman Falls of side Deceased was engaged in the shaft, with two other workmen, repairing a float wire in connection with a pump, when a stone fell from the side, and striking him, he was precipitated to a scaffold 26 fathoms below. 1903 February 21 Durie Fife Fife Coal Co Ltd Richard Fullerton 42 Pit joiner Falling from part way down Deceased, with three other workmen, was engaged removing the pipes &c., from an abandoned shaft. During the operations it was necessary to remove a batten of wood which was in the way of the cage, and to do so deceased stood on a scaffold which was being supported by the batten. When the batten was freed, it and the scaffold on which he stood fell down the shaft carrying him with them. He fell into 8 fathoms of water, and some days elapsed before his body was recovered. 1903 March 3 Blairenbathie Kinross Fife Coal Co Ltd James King 48 Miner Falls of roof Deceased was stripping the coal off a lype at a longwall face, when a stone 8 ft. 0 in. in length by 3 ft. 6 ins. in width, and about 3 ft. 0 in. in thickness at centre, suddenly fell upon him, killing him instantly. The stone was triangular in section, and fell from between two parallel lypes, converging upwards. The outer lype had not been seen prior to the accident. The place was well propped. 1903 March 8 Bankton Haddington Forth Collieries Ltd John O'Hare jun 27 shaftsman Shaft accidents  miscellaneous Owing to a large increase of water, chests had to be requisitioned to raise it from the shaft bottom and were to be emptied on arriving at the top automatically by lever arrangements. When the first chest arrived deceased and the oversman got into it in order to fix the position at which the lever was to come into operation to empty the chest, and while thus engaged the chest was suddenly raised and he was crushed against the fence at the top. The emptying of the chest had taken the weight off, and the brake not being on the engine moved. 1903 March 10 Kenmuirhill No 2 Lanark Glasgow Coal Co Matthew Clark 28 Waggon shifter On surface  railways, sidings or tramways He stood in front of a full waggon holding a prop against it to let other waggons move it, but the prop was knocked out and he was crushed between the waggons. 1903 March 11 Clydeside Lanark United Collieries Ltd John Lundie 37 Waggon trimmer On surface  railways, sidings or tramways While pinching back a waggon to take out a trig the pinch slipped. He fell, and the waggon ran over his leg. 1903 March 14 Ferniegare No 1 Lanark Archd. Russell John Miller 31 Bottomer Falling from part way down He pushed an empty hutch into the open shaft at a mid-working and fell after it to the bottom. From Main body of report: Three of the fatal accidents happened at mid-workings to bottomers who fell down the shaft. The first of these occurred at Ferniegare, No. 1 Pit. The miners being idle, the bottomer disconnected the gates fencing the entrance to the shaft from the wire connecting the gates with the indicator in the engine-house, in order to get some repairs done. Apparently, while he was away from the shaft, the engineman, without giving a signal as he ought to have done, raised the cage from the mid-working. The bottomer seems to have opened the gate, and, thinking that the cage was still there, pushed an empty hutch into the open shaft and fell after it.
. Probably none of these three accidents would have happened if the regulations had been observed. 1903 March 19 Carfin No 1 Lanark Wm Dixon Ltd Simon Cristolitus 29 Drawer Falls of side Fall of clay from working face while passing along it. 1903 March 25 Mossbeath Fife Fife Coal Co Ltd George Lindsay 16 Miner Shaft accidents  whilst ascending or descending by machinery Deceased and some others were descending to a mid-working. 33fathoms above pit bottom, on the lower deck of a double-decked cage, while eight men were ascending on the opposite cage, which was also double-decked. Owing to momentary forgetfulness, the engineman ran the descending cage past the mid-landing, and then considered it safer to bring the ascending cage to pit bank and let the men off before reversing. When the men left its upper deck the pithead man signalled to have the lower deck brought up to the landing ; and, simultaneously, the bottomer, recognising that the men on the cage at pit bottom were mid-working men, signalled for the cage to be raised. Unfortunately, at the same moment deceased attempted to jump off the cage at pit bottom, and was caught and crushed against the landing. 1903 March 27 Auchenharvie No 5 Ayr Glengarnock Iron & Steel Co Ltd Michael Duffin 25 Shot firer Miscellaneous underground  by explosives He failed to take proper shelter while firing a shot of saxonite and carbonite by electricity, and was struck by a projected stone. 1903 March 30 Gilbertfield No2 Lanark United Collieries Ltd James Biggans 15 Coupler Haulage  run over by tubs While uncoupling hutches a "race" of hutches coming up crushed his head between them. He resumed work on 7th April but took suddenly ill and died. 1903 April 3 Shieldmains Ayr A G Moore & Co Samuel Paterson 49 Picking table foreman On surface  miscellaneous When lifting a derailed hutch on a gangway with his hands on the railing, the railing gave way and he fell over the gangway. 1903 April 13 Grangemouth Stirling Grangemouth Coal Co Ltd John Padkin 52 Waggon driver On surface  railways, sidings or tramways Deceased was hauling a rake of four small waggons, by means of a horse towards the loading jetty, and when nearing the weighing house he stumbled as he stepped off the leading waggon and one wheel of the waggon passed over him. 1903 April 14 Carfin No 1 Lanark William Dixon Ltd Frank Svohl 23 Drawer Falls of roof Fall of roof on road while redding a fall. 1903 April 15 Lochwood No 3 Lanark Lochwood Coal Co Ltd Charles Downie 44 Miner Miscellaneous underground  by explosives Two shots of compressed gunpowder were being fired. His neighbour lit the fuse of one and he attempted to light the other and thought that he failed to do so. The first lit shot went off, and on returning to relight the other it went off, killing Downie and injuring his neighbour. 1903 April 21 Little Raith Fife Lochgelly Iron & Coal Co Ltd William Bowman 22 Miner Falls of roof Deceased was engaged withdrawing props from a lift, where the coal had been extracted, when a large stone suddenly fell from the roof and completely buried him. 1903 April 22 Birkenshaw Lanark Larkhall Fireclay Co Ltd Wm Mair 38 Miner Falls of roof Fall of roof at roadhead while setting a crown to secure it. 1903 April 23 Lochhead Fife Wemyss Coal Co Ltd Thomas Nicol 52 Miner Falls of side Deceased was about to commence holing, when a large piece of coal fell away from an unseen lype. 1903 April 24 Bogside Ayr Wm Baird & Co Ltd William Rae 15 Pony driver Falling into shaft from surface He opened the gate at the top of a blind pit, pushed a full hutch into the open shaft and fell after it. From Main body of report: A pony driver also got killed by opening the gate at the top of a blind pit while the cage was at the bottom, pushing a full hutch into the shaft, and falling after it. An accident of this kind could not happen if, instead of a gate opened by hand, a fence actuated by the cage and therefore automatic in its action were used. 1903 April 27 Wallyford Edinburgh Edinburgh Collieries Ltd Robert McEwan 14 Stone picker On surface  by machinery Deceased was walking on the picking table in the opposite direction to that in which it was travelling, when he stumbled and fell among the driving wheels and was fatally crushed between the spur wheel and a beam. From Main body of report: A boy was walking on a travelling table in the opposite direction in which it moved, and stumbling fell on the top of the driving wheels, which were fenced around but not boxed in. This is a bad habit indulged in by many of the young persons employed at the tables in cleaning the coal, and although warned, and in some cases examples made by dismissal, the thing continues, and the wonder is that accidents from this cause are not more frequent. 1903 April 28 Holytown No 12 Lanark James Nimmo & Co Ltd Alexander McGibbon 28 Fireman Miscellaneous underground  by explosives Explosion of bellite when preparing to charge a shot-hole. Another man was injured. The particulars of the accident are not known. 1903 April 30 Carfin No7 Lanark Wm Dixon Ltd David Hostler 27 Miner Falls of side Fall of coal. 1903 May 2 Hill of Beath Fife Fife Coal Co Ltd Charles Izatt 26 Miner Falls of roof Deceased apparently was taking off coal at the face, when a stone fell from the roof, killing him instantaneously. The stone fell away from an unseen lype. 1903 May 6 Common No 16 Ayr Wm Baird & Co Ltd Richard Corrie 29 Miner Miscellaneous underground  by explosives While firing a shot of fracturite it went off in some unexplained manner. Apparently he thought it had missed fire and he returned to it. 1903 May 6 Stonelaw No 1 Lanark Farme Coal Co Ltd John Rincavich 22 Miner Falls of roof Fall of roof at working face. 1903 May 9 Carfin No 6 Lanark Wm Dixon Ltd John McKey 27 Joiner On surface  miscellaneous When pinching a plank from off a scree the pinch slipped and struck him behind the ear. He worked till 18th May when erysipelas set in and he died on the 20th. 1903 May 11 Howmuir Lanark Auchinlea Coal Co Joseph Smith 40 Sinker Miscellaneous underground  by explosives Three shots were about to be fired at the bottom of a sinking pit, and deceased was sent to warn some men who were driving a lodgment, and to prevent them from coming outbye. Two shots were fired, but owing to a damp fuse some delay took place with the other, and a second messenger was sent to warn the men in the lodgment. Owing to a misunderstanding as to his message, deceased left the lodgment prematurely and was struck by a piece of rock thrown by the shot. 1903 May 12 Auchinraith No 2 Lanark Merry & Cunninghame Ltd Frank Regan 45 Road repairer Falls of roof Fall of roof on haulage road while repairing it. 1903 May 12 Neilsland No 1 Lanark John Watson Ltd Jas Mathie 56 Miner Falls of roof Fall of roof at working face. 1903 May 20 Kirkwood No 1 Lanark United Collieries Ltd Robert Halliday 40 Brusher Falls of roof Fall of roof at brushing face. Died in September, and the accident was not reported till then. 1903 May 22 Broomhouse Lanark Haughhead Coal Co David Thomson 39 Fireman Shaft accidents  whilst ascending or descending by machinery When ascending the shaft alone in the cage he fell out. 1903 May 22 Camps Lanark Camp Coal Co Ltd John Jarvie 37 Miner Falls of roof While engaged withdrawing props after stoop was extracted, the roof fell and caught him. An attempt was made to rescue him, but a second fall taking place, he was completely buried. 1903 May 22 Drumgrange No 10 Ayr Dalmellington Iron Co Ltd Constantine Morgan 60 Brusher Falls of roof Fall of roof at working face, apparently when knocking out props. 1903 May 26 Glengarnock No 6 (Ironstone) Ayr Glengarnock Iron & Steel Co Ltd Jas Findlay 55 Roadsman Falls of roof Fall of roof on road while enlarging it. 1903 May 27 Climpy Lanark Climpy Coal Co (Geo L Watson) William Baird 49 Brusher Falls of roof While deceased was putting a building in the wall with the debris made while brushing the roadway, the roof fell and injured him, causing his death seven days later. 1903 May 28 Bothwell Park No 2 Lanark Wm Baird & Co Ltd Daniel Lynch 30 Brusher Miscellaneous underground  by explosives While pulling out the wires and detonator from a charge of saxonite it exploded. From Main body of report: Occurred at Bothwell Park Colliery, and occurred in unusual circumstances. The deceased brusher charged a shot-hole with saxonite, using an electrical fuse and detonator. When the shot-firer came round he informed him that he had no shots to be fired, and shortly after sent after the latter to bring him back, but he had disappeared and could not be found. The deceased then was in the act of attempting to pull out the wires and detonator, when the charge exploded and killed him. The other men who were present professed entire ignorance of how the accident occurred, and it was some time after ere the real facts of the case were divulged. 1903 June 6 Balgonie Fife Charles B Balfour James Bell 29 Miner Falls of roof Deceased was engaged in the top division of the Dysart Main Coal, working off the coal coming back, and at the time of the accident was "backening" coal toward the roadhead, when the roof suddenly fell upon him. 1903 June 10 Skellyton Lanark United Collieries Ltd Jas Magee 19 Bottomer Falling from part way down He pushed an empty hutch into the open shaft at a mid-working and fell after it to the bottom. The second of these accidents occurred at Skellyton Colliery. In this case the bottomer, apparently without looking to see if the cage was at the mid-working, brought forward a full hutch, opened the gate, pushed the full hutch into the open shaft, and fell after it. The engineman stated that he did not observe the indicator show the gate open, but even if he had he would not have had time to signal to the deceased before the accident happened. 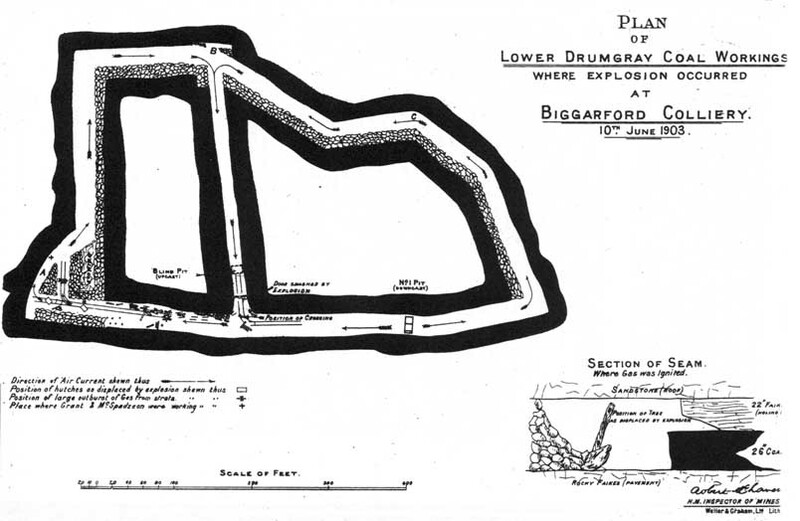 From Main body of report: The most serious explosion occurred at Biggarford Colliery, whereby four men were seriously injured, one of whom subsequently died. The No. 1 shaft, which was originally sunk to the Kiltongue coal at a depth of 58 fathoms, was re-sunk to the Lower Drumgray coal 18 fathoms below [see diagram]. The bottom stoop had been turned, and the working was being laid out on the longwall method at A and B. The air current to ventilate the seam was forced down the No. I shaft by a fan at the top, and was said to be about 9,000 cubic feet per minute ; this current was split at the bottom in about equal proportions, and after traversing the stoop returned by a blind shaft to the Kiltongue workings and thence by the outlet shaft to the surface. At the time of the accident there were nine persons in the seam-four at A, three at B, and two at C. At A a " branch " road had been formed to the rise off the level. Shortly before the accident the men working in the " branch " heard the roof " working," and fearing that it was about to fall were preparing to leave the place when suddenly gas ignited at one of the naked lights and an explosion resulted. The lights carried by all the men in the seam were extinguished, but, notwithstanding, they managed to reach the shaft and were raised to the surface. An examination of the workings afterwards showed that at A the roof of the newly opened longwall place had taken the "first break," and a considerable quantity of gas had been liberated. The explosion was very violent, as was evidenced by the tubs being derailed and thrown toward the stoop side, rails lifted from their, position, props along the level road thrown out, and doors and stoppings destroyed. The force was from A toward the shaft. At the Inquiry held under the Fatal Accident Inquiry (Scotland) Act, 1895, it transpired that shortly after starting to cut the bottom stoop gas was seen on the opposite side of the shaft from A, and safety lamps were used, but these were subsequently withdrawn when the gas disappeared. The jury added a rider to their formal verdict to the effect that the management had acted imprudently in withdrawing the safety lamps. Had safety lamps been in use no explosion would have occurred, and I quite agree with their rider. 1903 June 18 Orbiston No 1 Lanark Summerlee & Mossend Iron & Steel Co Michael McCafferty 42 Brusher Miscellaneous underground  by explosives While charging a shot-hole with gunpowder a spark from his lamp ignited 4 lbs. of the explosive. 1903 June 19 Bothwell Park No 2 Lanark Wm Baird & Co Ltd Wm Shiverall 24 Fireman Falls of roof Fall of roof at brushing face when about to fire a shot just after firing another close to it. 1903 June 26 Niddrie Edinburgh Niddrie & Benhar Coal Co Ltd George Brown jun 15 Incline brakesman Sundries Deceased was employed as brakesman at the top of a brake incline 40 fathoms in length and having an inclination of 73°. The brake lever was situated at the uppermost bench, the formation of which had not been completed. It was not part of deceased's duty to place the tubs on the carriage, but it appeared that he had attempted to do so, probably to assist the miner, who was a relative. He forgot that the carriage was not at the bench, pushed the loaded tub into the incline, and fell with it to the bottom. 1903 June 30 Dumbreck No 2 Stirling Wm Baird & Co Ltd Wm Barrie 69 Miner Shaft accidents  miscellaneous When stepping off the cage he slipped and fell into the cage seat. The accident was not reported until after his death on 13th September. 1903 July 6 Rosehall No 3 Lanark R Addie & Sons Collieries Ltd Joseph Patrick Hannah 21 Drawer Haulage  run over by tubs Crushed by a full hutch when going up a self-acting incline, the prop to which the pulley was fixed having broken. 1903 July 8 Muirbeath Fife Henry Ness & Co Ltd John Whyte 19 Drawer Haulage  ropes or chains breaking Deceased was sitting at the foot of a cut chain brae dipping 1 in 3 ¾, while a loaded tub was being run down. The chain broke, owing to the rivet of a splicing link giving way, and the full tub struck deceased killing him instantly. 1903 July 9 Leven Fife Fife Coal Co Ltd James Halley 14 Pithead runner On surface  by machinery After the signal was given to the engine-keeper that all was ready, deceased thinking the guard to keep the tubs in position on the cage was not properly up put his right foot to the guard, and just then the cage left the surface and his leg was caught between the cage cover and side of shaft and completely severed at the thigh. He died four hours afterwards. 1903 July 13 Bellfield No 4 Lanark Wm Barr & Sons Robert Lockhart 18 Bencher Haulage  run over or crushed by tubs While riding on a bogie on a low part of a haulage road along with other men he got crushed against the roof. He died from his injuries on 25th February 1904. 1903 July 14 Wellsgreen Fife Fife Coal Co Ltd William McCabe 26 Drawer Other haulage accidents Deceased was hanging on a tub at the foot of a short wheel brae, and before it had been completely hooked on shouted to the drawer at brae head to shove over. This was done more promptly than he expected; the end of the chain was jerked away and the full tub ran down, struck the corner of the empty one and drove it against deceased, causing injuries which resulted fatally two days afterwards. 1903 July 16 Cadzow No 2 Lanark Cadzow Coal Co James Docherty 35 Miner Falls of side Fall of coal, owing to sprag giving way. 1903 July 17 Bogleshole No 4 Lanark James Dunlop & Co Ltd John Boyd sen 40 Miner Explosions of fire damp or coal dust Upon entering their working place to commence work after it was reported all clear by the foreman their naked lights ignited fire-damp and they were fatally injured by the explosion. Another man was injured. From Main body of report: The first fatal explosion took place in Bogleshole No. 4 Pit, Lanarkshire and resulted in the loss of two lives and the injury of another man. The fireman reported the miners' working place all clear, and on entering it to commence their day's work their naked lights ignited an accumulation of fire-damp. It seems that during the previous night an explosion had occurred in the same section of workings and it ignited some timbering and screens, and, in consequence, the air current had been diverted and shut off from the working places for some time. If the fireman made his inspection thoroughly it is difficult to understand how he failed to detect the presence of gas. Safety lamps have since the explosion been used in these workings. 1903 July 20 Ayr-Drumley No 1 Ayr George Taylor & Co Robert Davidson 17 Miner Falls of roof Fall of roof at working face. 1903 July 23 Castlehill Lanark Shotts Iron Co Ltd James Mitchell 37 Miner Falls of side Deceased was holing, when a part of the coal fell away from an unseen lype. 1903 July 23 Holytown No 8 Lanark James Nimmo & Co Ltd Wm Cunningham 29 Coal cutter Miscellaneous underground  by machinery While a Hurd bar cutting machine, with bar in motion and exposed, was traversing the coal face the cutters caught his clothing and drew him in. From Main body of report: One man lost his life in Holytown Colliery, Lanarkshire, by a Hurd's bar coal-cutting machine driven by electricity. At the time of the accident the machine was travelling along the coal face and not cutting coal, and during this operation the cutter-bar was revolving and quite exposed. The deceased was lifting the rails at the rear of the machine close to the cutter-bar, and while stooping down his loose vest was caught by the revolving cutters. The consequence was that he was drawn in and so severely lacerated that he succumbed to his injuries. The cutter-bar ought to have had a covering to securely fence it as required by General Rule 31 when the machine was in operation and not cutting coal, or the machine should have been so constructed that the cutter-bar would be out of gear when it was exposed. From Main body of report: A close place was driven to a "want" in the Kiltongue coal seam and stopped. It was proposed to re-start the heading part and extend it for a haulage way to a section at work to the rise, and it is probable that deceased was examining the roadway to see what repairs were necessary, when his naked light ignited some gas, causing an explosion and injuring him so seriously that he succumbed two days afterwards. A part of the heading was the main return airway, and beyond this part the brattice, which had been in use when the road was being driven, stood, to allow a current of air to circulate to keep it clear, but this brattice had got damaged and air had short circuited and gas accumulated. The quantity of gas appeared to be small, as no damage was done to the roadway. The roadway was part of the ventilating district, and as such should have been inspected in terms of Section 5 (1) of the Coal Mines Regulation Act, 1896. This had not been done by the fireman, and evidently deceased had not insisted on it. At no time previous to the accident had gas been seen in the seam, and deceased thought he was quite safe in going into the roadway with an open light, a mistake which cost him his life. 1903 July 27 Quarter No 7 Lanark United Collieries Ltd George Crossley 32 Miner Falls of roof Fall of roof at working face. 1903 August 7 Devon Clackmannan Alloa Coal Co Ltd Adam Dunsmore 23 Miner Falls of roof Deceased was holing at the face, when the fireclay roof above suddenly fell on him, causing instant death. The fall came away from a keen lype. 1903 August 10 Carfin No 1 Lanark Wm Dixon Ltd Joseph Beelavicke 21 Miner Falls of side Fall of clay from working face. 1903 August 19 Glenbuck  Galawhistle Ayr Cairntable Gas Coal Co Ltd Robert Overand 32 Miner Falls of roof Fall of roof in working place which was not propped as required by the regulations. 1903 August 20 Highhouse Ayr Wm Baird & Co Ltd Terence McPortland 65 Gate keeper On surface  railways, sidings or tramways When attempting to open crossing gates he was run over by a Railway Co.'s runaway van. 1903 August 21 Garriongill Lanark Coltness Iron Co Ltd Samuel Graham 33 Bottomer Shaft accidents  miscellaneous Deceased was crossing the cage seat while cage was running in the shaft, when it came down and crushed him. 1903 August 24 Lightshaw No 4 Ayr Wm Baird & Co Ltd John Ferguson 25 Miner Falls of side Fall of head coal beneath which he went after the props were withdrawn. 1903 August 26 Busbiehead No 2 Ayr J & R Howie Samuel Howie 15 Labourer On surface  railways, sidings or tramways Crushed between two waggons while attempting to couple them. From Main body of report: A boy 15 years of age was evidently assisting to move railway waggons illegally, and while attempting to couple them got crushed between two of them. The pitheadman who was moving the waggons alleged that he did not know that the boy was there, but it is doubtful if this statement can be accepted as correct. 1903 August 27 Craighead No 1 Lanark Wm Baird & Co Ltd Gavin Cook 20 Repairer Falls of roof While knocking out a prop to allow a brick wall to be built the roof and side gave way. 1903 August 28 Ellismuir No 2 Lanark United Collieries Ltd George Reynolds 24 Haulage man Haulage  run over by tubs Crushed in some unexplained manner by his bogie when bringing a "race" of hutches out to the pit bottom. 1903 August 31 Gilbertfield No2 Lanark United Collieries Ltd Jas Goudie 24 Miner Falls of side Fall of coal. Caused by failure to set sprags in terms of the regulations. 1903 September 4 Dechmont Lanark Archd. Russell Daniel Marrs 74 Stone picker On surface  railways, sidings or tramways When crossing the rails at the screen he was run into by the Railway Co.'s locomotive. 1903 September 10 Olive Bank Edinburgh Niddrie & Benhar Coal Co Ltd William Johnstone 37 Sinker Shaft accidents -things falling from part way down While the kettle was descending empty and when about 20 fathoms down it left the rope, and falling straight down, struck deceased in the bottom of a sinking shaft. There were eight sinkers in the bottom, and all ran to the pipe side, except deceased, who ran right in the way of the descending kettle. The pin which connected muzzle on kettle to winding rope came out apparently by vibration while kettle was running in the shaft. 1903 September 10 Carronhall Stirling Carron Co Cornelius Hotchkiss 38 Miner Falls of roof Deceased had fired a cut shot close to one side of his place, and, immediately after, was picking some dirt from amongst the fallen coal, when a mass of sandstone, relieved by the shot, fell upon him, killing him almost instantaneously. 1903 September 11 Rosehall No 5 Lanark R Addie & Sons Collieries Ltd Robert Bell 45 Miner Sundries Coming in contact with signal wires which had accidentally been charged with electricity from the power cables. From Main body of report: In Rosehall, No. 5 Pit, Lanarkshire, an accident occurred by which two men lost their lives by an electric shock. Near the pit mouth there is a steam engine driving an electric generator which is used to supply power to underground pumps. The dynamo was made by the British Thomson-Houston Company, Limited, and is a three-phase alternating current generator of 550 volts and 52 1/2 amperes at a speed of 1,000 revolutions per minute. Three cables are taken down one end of the shaft from the dynamo, and from the shaft bottom shown on the accompanying plan they are conveyed along a haulage road to the point D where a motor is placed [see diagram]. This motor drives a pump, but it also actuates a dynamo of the continuous current type with a voltage of 237. From this latter dynamo two power cables are taken by E past F to the point G where there is a motor driving another pump. A second pair of power cables goes from the same dynamo down the road H to a motor for driving a third pump at J. Another motor placed near the bottom of the shaft drives a pump which raises water to the Ironstone mid-working. In the haulage engine-house near the pit head there is placed an electric battery of 16 Leclanche cells and a signal bell. From the battery two galvanized iron signal wires are taken down the end of the shaft alongside the electric power cables, but separated from them by a space of about 18 inches. The signal wires are carried on porcelain insulators to the point E, and from that point, a pair of wires goes to the point G and another pair goes to the point H.
The shaft is 173 fathoms deep, and both the power cables and the signal wires were fixed in the shaft at some 30 different points to porcelain insulators placed at irregular distances apart. Each power cable between the generator and the pit bottom consisted of a single copper wire covered with a thin woven material which, however, did not insulate the wire, and at several points the covering was stripped from the wire. From the pit bottom to the motor at the point D each power cable consisted of a strand of 19 copper wires of No. 16 gauge, and was properly insulated. For the greater part of the distance between the pit bottom and the point D the signal wires and the power cables were fixed on the same side of the road, and at several points the signal wires touched the insulating covering of the cables. From the shaft to the point F the haulage road is level. From F to G it dips at an inclination of 1 in 6. The coal is drawn to the shaft by the "main and tail rope" system of haulage, and the haulage rope is taken down the pumping end of the shaft in a wooden rhone. Signals to the engineman are made by the haulage man making contact between the two signal wires which are about 2 1/2 inches apart. It appears that about 3.30 p.m. on the day of the accident the haulage man was about to take a "race" of full hutches out to the shaft from the Kiltongue Coal level at the point L, and he gave the usual signal to the engineman. When the race started it was stopped after it had proceeded only a few yards. Thereupon he took hold of the signal wires with his hand to repeat the signal, and on doing so got so severe a shock that he could not let go. Two miners happened to be present, and seeing that something was wrong, one of them took hold of the haulage man by the wrist, and he too got a shock. Thereupon the other miner struck the signal wires with a hammer and the haulageman fell down insensible, and remained so for some 10 minutes. The engineman stated that after he started the ''race" in obedience to the signal he had only drawn it forward a few yards when the signal bell began to ring, and he at once stopped his engine, but the bell continued ringing. About a minute after stopping the engine, while standing on the dry wooden floor, he took hold of the wire attached to the zinc rod of one of the battery cells and got a distinct shock. He thereupon lifted out the zinc rod with two pieces of wood, and on putting it back in its place shortly after, the bell was silent. The bottomer at the Ironstone mid-working, 43 fathoms above the bottom of the shaft, stated that about 3.30 p.m. he had occasion to make a signal to the pit bottom, and the moment his hand touched the signal lever K (see Section of Pit) he got a severe shock. About the same time that these occurrences took place three miners were proceeding from their working places to the pit bottom, and were walking in Indian file up the haulage road at the point M when, apparently about the same instant, the first and the last man suddenly fell dead. At the point M the top of the rails are covered to a depth of 1 1/2 inches with hard caked dirt which is dry, but not electrically so, and a person walking past is not able to touch the rails with his foot. The signal wires are at a height of 3 1/2 feet above the rails and only 6 inches beyond the perpendicular of the rail. While walking towards the shaft a man's right arm or hand could therefore readily come in contact with the signal wires at this point. The doctor who examined the bodies of the deceased as soon as they were taken to the surface reported that the body of one of the men was soiled all over with coal dust, and that on the upper part of the right arm the dust was in the form of streaks radiating from a centre, which indicated that he had received an electrical shock there. He found on the back of a finger of the right hand of the other man's body an abrasion, but said that he could not infer from that that the man had come in contact with a live electric wire. In investigating this accident I was much indebted to Mr. Gilbert Scott Ram, Electrical Inspector of Factories, who made a careful examination of the electrical installation at the colliery and also gave evidence at the Fatal Accident Inquiry as an electrical expert. We were unable to find any signs of burning on the signal wires or any point of leakage in the insulated portion of the power cables at which the signal wires could have been abnormally charged with electricity. The shaft is damp, and at one point both the power cables and the signal wires were touching the wet wood lining of the shaft, and all were embedded in wet coal dust or dirt. Thereafter Mr. Ram, as an experiment, reproduced at the Board of Trade a similar state of matters, and found that there was sufficient leakage of current through the wet coal dust to charge the signal wires to an extent that would give a fatal shock if touched. But as the signal wires were abnormally charged for only a short period, any leakage at the point just described could not have anything to do with the accident. At various points in the shaft I found that by exerting a pressure of not more than 3 or 4 lbs. the power cables could be made to touch the signal wires, and as one of the cages runs up and down within a foot of the cables, in the absence of definite information I came to the conclusion that the most probable cause of the accident was a piece of coal falling from a hutch in the cage and resting on a bunton where it pressed a power cable against the signal wires which became charged. When the cage again passed the piece of coal may have been dislodged, leaving no evidence of what had occurred. I could, however, get no evidence that at this time anything had fallen down the shaft. Mr. Ram is of opinion that either in this manner or by some metal tool falling across the wires and forming contact the signal wires got charged from the power cables in the shaft, and I think that there can be no doubt that the non-insulated condition of the power cables in the shaft was the cause of the signal wires being abnormally charged. The man who was walking between the men who were killed was unable to tell whether or not either of them touched the signal wires, but it is evident that either inadvertently or otherwise both, of them came in contact with them when highly charged and got the shock which killed them. 1903 September 12 Portland No 5 Ayr Portland Colliery Co Ltd Robert Hay 25 Miner Falls of roof Fall of roof (coal and stone) in working place. 1903 September 14 Stane Lanark Turners Ltd George Whitefield 55 Bottomer Shaft accidents  miscellaneous Deceased was on the cage pulling a loaded tub towards him, when it was suddenly raised and he was crushed at the door heads. The engine-keeper had apparently raised the cage without receiving a signal to do so. 1903 September 16 Wallyford Edinburgh Edinburgh Collieries Ltd John Brown McNeil 39 Miner Falls of side Deceased had withdrawn a prop to "drop" the head coal, when the coal suddenly fell upon him. 1903 September 16 Upper Darnley Mine (fireclay) Renfrew Allan Kirkwood Jas Wilson 35 Drawer Falls of roof Fall of roof on road. 1903 September 17 Dalbeath Fife Fife Coal Co Ltd Thomas Stewart 42 Miner Falls of side Deceased had taken a sprag out to enable him to out down his coal, but as he failed to bring it down he began to ''mend" the holing, when the coal fell over and crushed him. He died on 30th May, 1904..
1903 September 21 Greenfield, Threestonehill No 8 Pit Lanark Greenfield Coal & Brick Co Ltd Walter Neilson 58 Miner Falls of side Fall of coal and " fallen." 1903 September 28 Rosehall No 13 Lanark R Addie & Sons Collieries Ltd Thos Cunningham 39 Miner Falls of roof Fall of roof at working face. 1903 September 29 Knownoblehill Lanark United Collieries Ltd James Wilson 57 Sinker Falls of side Deceased was working at the bottom of a sinking pit 53 fathoms in depth, only three-fifths of which depth was barred. A wedge-shaped piece of stone fell from an unascertained place in the shaft, and struck him, causing injuries which terminated fatally an hour afterwards. 1903 October 1 Kenmuirhill Lanark Glasgow Coal Co Jas McGeachan 30 Drawer Miscellaneous underground  by explosives Struck by the flame, &c, from a shot of 2 ½ lbs. of compressed gunpowder which blew through another shot-hole. 1903 October 5 Westburn No 2 Lanark Westburn Colliery Co Wm Finlayson 26 Roadsman Explosions of fire damp or coal dust An outburst of water filled up some dip workings from which the water was being pumped. The lowering of the water restored the ventilation and brought out gas which evidently ignited at his naked light although he had been instructed to use a safety lump. From Main body of report: The second fatal explosion took place in Westburn Colliery, Lanarkshire. An outburst of water had filled up some dip workings and the water was being pumped out. The air current having been cut off and the pumps being in the return airway, the deceased, who was attending to the pump, was instructed to use a safety lamp alone. It seems, however, that he had a naked light as well as a safety lamp, and the consequence was that, when the level of the water was lowered and the ventilation restored, an accumulation of gas forced out by the current ignited at his naked light and his rashness cost him his life. 1903 October 7 Michael Fife Wemyss Coal Co Ltd Forbes Moodie 42 Roadsman Other haulage accidents Deceased had visited a section to the rise and was proceeding down the incline when a loaded tub ran away from the top, and before it had gone very far it left the rails and the contents were showered down the roadway, and a piece of coal struck him on the head ; when found he was 24 feet below the tub. The injury was thought to be slight, but he subsequently died from the effect on 26th January, 1904. A good set of blocks was provided at the top, but it appears the wheeler had either neglected to put it in or had insufficiently fixed it, and on bringing the tub forward it ran over the brae. 1903 October 9 Hill of Beath Fife Fife Coal Co Ltd David Hunter 16 Hanger-on Other haulage accidents A rake of full tubs was pushed over at the top of an incline, before the empty rake was attached to the rope, and on hearing the tubs coming the man who assisted shouted to the deceased to get into a manhole close by while he ran outbye. Deceased evidently thought he would be safer to run outbye also, but was overtaken by the runaway tubs and was caught just as he was passing through a trap door. The wheeler at the top mistook the signal. The method of signalling was defective. 1903 October 11 Parkhead Lanark Glasgow Iron & Steel Co Ltd Robert Ramsay 41 Engine keeper On surface  miscellaneous Deceased was blowing off a boiler under a steam pressure of 100 lbs. He prematurely opened an auxiliary valve which was only used for washing-out purposes, became enveloped in steam and was so severely scalded that he succumbed nine hours afterwards. 1903 October 15 Allanton Lanark Wm Barr & Sons David Hughes 37 Miner Falls of roof Fall of roof on haulage road while repairing it. 1903 October 16 Castlehill Fife Shotts Iron Co Ltd William Aitken 64 Labourer On surface  railways, sidings or tramways Deceased was bringing forward two empty waggons for dross at cart screen when he was fatally crushed between an upright post and second waggon. The space between the post and side of waggon was 4 ½inches. 1903 October 17 Auchincruive- Mossblown No 1 Ayr Auchincruive Coal Co John McDonald 35 overman Miscellaneous underground  suffocation by natural gases When clearing out fire-damp from a heading he was overcome by the gas. From Main body of report: An overman in Auchincruive Colliery, Ayrshire, lost his life by being suffocated in an accumulation of fire-damp which he was endeavouring to dislodge. The gas was collected in a narrow heading ventilated by a sheet iron tube. He had other two men with him, and being unable to reach the inner end of the air tube with a safety lamp on account of the gas, he took one of the men with him and foolishly attempted to go forward in the dark. The consequence was that they were both overcome. Fortunately, the third man was able to save the fireman who accompanied the overman, but several hours elapsed ere the dead body of the latter was reached. 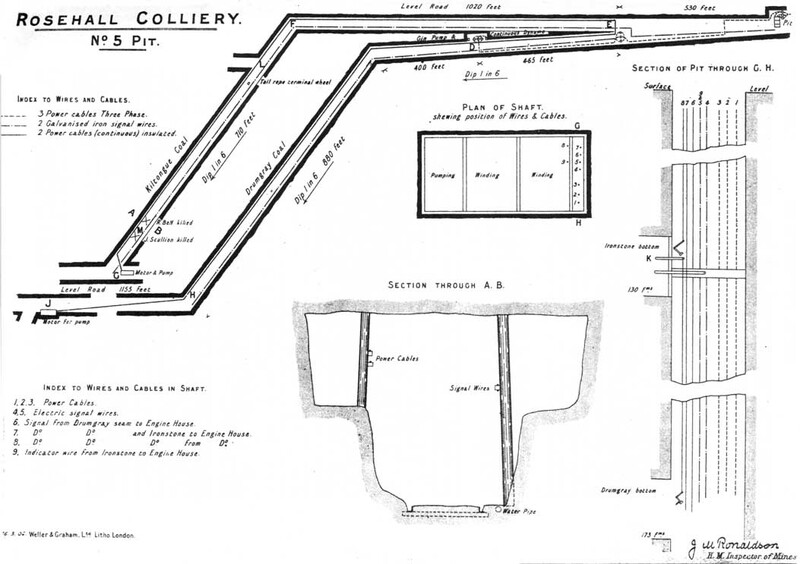 1903 October 19 Balbardie Linlithgow Balbardie Colliery Co Ltd James Glen 30 Miner Miscellaneous underground  by explosives Deceased and his brother were firing two holing shots at the face of a stone mine. Gutta percha covered fuse was used. Deceased's fuse did not burn properly, so they decided to extinguish it by rubbing with their fingers. When the other shot exploded deceased returned almost immediately to relight his one ; but when he was still 20 yards from the face the shot exploded, and a fragment of rock struck him on the head causing injuries which terminated fatally an hour afterwards. 1903 October 19 Carberry Edinburgh Edinburgh Collieries Ltd Robert Ritchie 24 Pitheadman On surface  miscellaneous Deceased ran a loaded tub of debris from the shaft to the waggon tip, and by some means was thrown over the scaffold to the railway below, a distance of 14 ft. The tub was found off the rails, and it is supposed that it had struck him as it came back after being emptied. The tip was a side one. 1903 October 19 Comedie No 5 Lanark Hugh Bain & Sons Francis McCrory 38 Miner Falls of roof Fall of roof on road while sitting near the pit bottom. 1903 October 20 Rosie Fife Bowman & Co Alexander Allan 17 Miner Haulage  run over by trams & tubs Deceased apparently had attempted to get on the rope in front of the first tub to ride up a dook and was thrown in front of the rake and dragged some distance. 1903 November 6 Arniston Edinburgh Arniston Coal Co Ltd Henry Brotherstone 32 Labourer On surface  miscellaneous Deceased was in a dross hopper clearing dross from the shoot leading into the hopper, and instead of standing on a plank provided for the purpose he stood on the dross. The man in charge of the waggons put a waggon under the hopper and opened the valve to allow the dross to fall into the waggon, when deceased's legs were seen protruding. Before he was rescued he had been suffocated. 1903 November 7 Lochgelly Fife Lochgelly Iron & Coal Co Ltd Donald Laird 27 Miner Falls of side Deceased was holing, when a piece of coal fell from the face upon him. On one side of the place a lype was visible, and it was from this lype that the coal fell. 1903 November 9 Blairenbathie Kinross Fife Coal Co Ltd William Black 41 Miner Falls of roof The roof had fallen across the face, and deceased and his neighbour were employed to "win" it out, and while clearing the debris from the roadhead a stone fell and struck him on the head. The injury was slight, but he was unable to work much afterwards and died on 2nd August, 1904. A post-mortem examination was made, and at the fatal accident inquiry medical evidence was given that the death was due to the accident. 1903 November 11 Inkermann-Douglas No 3 (ironstone) Renfrew Merry & Cunninghame Ltd Wm McEwan 45 Bottomer Haulage  run over by tubs Apparently he was knocked into the cage seat and crushed by a full hutch which ran forward by gravitation. 1903 November 11 Lochgelly Fife Lochgelly Iron & Coal Co Ltd John Anderson 40 Locomotive driver On surface  miscellaneous The waggons are hauled between the principal siding and two of the pits by means of a self-acting incline. Deceased for some reason unknown caught hold of one of the ropes just as the rake started, and was suddenly raised to a height of 20 ft, and letting go his hold he fell to the ground. 1903 November 12 Glenboig (Fireclay) Lanark Glenboig Union Fireclay Co Ltd Peter Uski (Pole) 48 Miner Falls of roof Deceased was stamping a hole for a shot in the bottom of the seam, when a stone fell from the roof and killed him instantaneously. 1903 November 13 Michael Fife Wemyss Coal Co Ltd John Welsh 14 Drawer Other haulage accidents A fall took place on a cut chain brae, and while it was being cleared deceased and some other drawers were sent up the brae to be out of harm's way. At the top were two loaded tubs, one on the left-hand side near the heading face and one on the right-hand side at the top branch to which the chain was attached. To clear the fall, three miners, who worked in the section, hauled up an empty tub from the foot of the brae with the chain attached; when the tub was filled they put snibbles in the wheels, to lower it down, but it overpowered them, and when it reached the bottom the sudden jerk on the chain caused the wheel tree at top to break and it struck the tub on left-hand side causing it to run away, which struck deceased as it passed him. The tub which ran away had its top wheels over the rail ends, but no snibbles were in the wheels, nor was there a rance behind. The brae was 116 yards long with an average gradient of 1 in 5. 1903 November 16 Banknock, Cannerton Stirling Young's Collieries Ltd Jas Mortimer 40 Miner Falls of roof Fall of roof in working place. 1903 November 17 Wemyss Fife Wemyss Coal Co John Penman 42 Miner On surface  railways, sidings or tramways Deceased with several other workmen was proceeding to his work, and was riding on the waggon next the locomotive engine, when the engine left the rails and he was thrown and crushed between the waggon and engine buffer. The engine left the rails at points leading to a new road in course of construction, and on investigation it was discovered that the points had been tampered with. 1903 November 19 Lanemark No 2 Ayr Lanemark Coal Co Ltd Wm Armstrong 50 Bricklayer Falls of roof Fall of roof while building a dam. It had not been properly inspected. 1903 November 26 Cowdenbeath No 10 Fife Fife Coal Co Ltd James Syme 36 Fireman Other haulage accidents Deceased placed a 10-f t. timber bar on the empty tubs of a rake running on a wheel brae to take it to a part where roof required repairing, and while the rake moved up he walked alongside to keep the bar in position ; at a low part of the roof the bar caught and it was thrown off the tubs on top of him. He died on 4th January, 1904. 1903 November 30 Oakley Fife Oakley Collieries Ltd Alexander McDonald 55 Brusher Falls of roof Deceasedwas engaged withdrawing props from under the roof to be brushed, when a stone fell and killed him instantaneously. He was partly under the brushing when stone fell. 1903 November 30 Bothwell Castle No 4 Lanark Wm Baird & Co Ltd Patrick McDade 30 Miner Falls of roof Fall of roof at working face. 1903 December 1 Fordell Fife Countess of Buckinghamshire John Heckie jun 14 Hanger-on Falling from part way down To obviate the necessity of a mid-working at winding shaft a drop pit is in use to lower the coal from the Five-feet seam to the Dunfermline Splint seam. The pit is 68 feet deep, and is worked in the usual way. The top is fenced by sliding gates with back balance weights so that slight pressure has to be applied by the hand to raise or lower them. Deceased was employed as a hanger-on at a brae foot close by the drop pit, and was in the habit of putting load tubs on and taking empty tubs off the cages without let or hindrance. The lad in charge of the pit was hurriedly called away to assist to re rail some tubs, and had apparently forgotten to lower the gate of the side on which a load tub had descended, and deceased coming forward shortly thereafter pushed a loaded tub into the open side and he and it fell to the bottom. 1903 December 1 Kirkwood No 1 Lanark United Collieries Ltd Robert Pirrie 20 Miner Falls of roof Fall of roof at working face. Props were not set within the specified distance. 1903 December 2 Newbattle Edinburgh Lothian Coal Co James Liddle 15 Pithead runner Falling into shaft from surface Deceased attempted to take an empty tub off the cage at the ''laigh" scaffold before it had rested on the shuts, the result was that one end of the tub was on the cage and the other end on the ground. The engine-keeper got the order to lower, but instead he raised the cage, and the tub fell into the shaft and he with it, falling a distance of 60 fathoms. 1903 December 2 Rosehall No 13 Lanark R Addie & Sons Collieries Ltd Thos Trainer 26 Miner Falls of roof Fall of roof on road while taking his breakfast. Another man was injured. 1903 December 3 Poneil No 1 Lanark United Collieries Ltd Joseph Dixon 22 Miner Falls of side Fall of top coal and clay which were not supported as required by the regulations. 1903 December 4 Ross No 1 Lanark Thos Barr's Trustees John Martin 28 Miner Falls of side Fall of coal. It was not spragged in terms of the regulations. 1903 December 11 North Motherwell Lanark Merry & Cunninghame Ltd William Henderson 55 Joiner On surface  by machinery Deceased who was about to execute some repairs on a revolving screen, had the machinery stopped for this purpose. The engine, which was fitted with a single eccentric, came to rest at the dead point, and as it was difficult to restart it from this position, the engineman disconnected the valve-rod to alter the set. Meantime deceased had stepped upon the pinion wheel to commence operations, and as the engine reversed his foot was caught and crushed by the spur wheel. He succumbed to his injuries three months afterwards. From Main body of report: This accident occurred in the Ell coal seam. The seam is worked stoop and room. Gas had never been seen in the section, and naked lights were used. The deceased worked in an ordinary, close place, Burns being in charge, and employing the boy Thomson. The two nearest rooms on the outbye side had been stopped on a reserved area a few days prior to the accident, and had been fenced off. In the outer of the two, which was about 82 yards outbye from the working face, the fence was placed 10 yards in from the corner of the stoop, and the rails were lifted out to this point, the entrance to the place being reserved as a lye or siding. Immediately inside of the fence the place had passed over an upthrow hitch of about 2 feet, causing a rise in the road at this point. The fireman in making his daily inspections did not pass beyond the fence, but regularly tested for gas there. The deceased stated that they had left their working place shortly before the close of their shift; that on their way outbye they had turned into the outer of the two abandoned drifts for a private purpose, and at a point immediately outside of the fence they had ignited fire-damp, which burned both severely. Thomson, who was without his coat, was more severely burned, and he succumbed to his injuries three days afterwards, and Burns on 18th January, 1904. The tubs of coal were usually drawn from their working place in sets of three, and on the night of the accident it appears they were three tubs short of their usual output. On examination, it was found that loose coal sufficient to fill about two tubs had been left lying at their working face ; that no additional coal was holed, or ready to be taken down, and that all the picks and the shovel used for filling the coal, had been removed from the place. These were found at the entrance to the drift in which the explosion took place ; the shaft of one pick was broken off close to the head, and that of the other had been spilt to an extent sufficient to render it useless for holing purposes. A lamp and cap were found respectively 3 feet and 9 feet outbye from where the fence had stood, and another lamp was found 26 feet in beyond the position of the fence. About three hours after the explosion, the drift was found to be clear of fire-damp, but partially fouled with after-damp. A pony driver subsequently admitted that, since the adjacent abandoned drift, between the working place and the locus of the accident, had been stopped and fenced off, he had lifted a tub of coal from its entrance, and the officials agree that some coal appeared to have been filled off the stoop side just outside of the fence. 1903 December 16 Gilbertfield No2 Lanark United Collieries Ltd Jas McMenemy 46 Repairer Falls of side Fall from side of road while enlarging it. 1903 December 18 Dechmont No 1 Lanark Archd. Russell Brone Sawries 25 Miner Falls of roof Fall of roof from "brushing" face. 1903 December 19 Leven Fife Fife Coal Co Ltd Alexander Petrie 65 Gate keeper On surface  railways, sidings or tramways Deceased had opened a level crossing gate to permit a locomotive to push a train of 21 empty trucks through. As the train approached the gate three trucks near the centre became derailed, were jerked outwards, and struck deceased, killing him instantly. 1903 December 22 Kinneil Linlithgow Kinneil Cannel & Coking Coal Co Ltd Janet Maxwell 14 Stone picker On surface  by machinery Deceased was employed to pick dirt from amongst the coal on a travelling band 30 ft. by 4 ft., which conveyed it from the screen to the truck, and which was driven by a horizontal shaft, parallel to and 3 ft. 9 ins. distant from it. She was standing with her back towards the shaft when her clothing was apparently caught by the head of a pinching pin in a thrust collar on the shaft, and she was carried round several times with it, receiving injuries which terminated fatally on the following day. 1903 December 25 Udston No 2 Lanark Udston Colliery Co Ltd George Boyd 16 Miner Falls of roof Fall of roof on road while passing with a hutch. 1903 December 26 Pumpherston (Oil Shale) Edinburgh Pumpherston Oil Co Ltd John Murdoch 27 Miner Falls of side A mass of shale fell away from a vertical joint at the corner of a stoop, in a working 8 ft. 6 ins. in height and dipping 1 in 5. Part of it fell upon deceased, killing him instantly. 1903 December 28 Dundonald Fife Dundonald Coal Co Michael Brien 33 Labourer On surface  railways, sidings or tramways Deceased was engaged about the sidings, and was discovered dead between two waggons. No one saw the accident, but it appears that a loaded waggon was run out from the screen and had moved down and collided with another, and evidently deceased had been crushed between them. 1903 December 29 Sitehill No 13 Lanark United Collieries Ltd William Law 24 Bottomer Falling from part way down In some way unexplained he fell down the shaft from a mid-working which was not fenced. 1903 December 31 Portland No 4 Ayr Portland Colliery Co Ltd Robert Bowman 21 Miner Falls of roof Fall of roof in working place. Another miner was injured in Hamilton Palace Colliery on 17th April, 1903, by a fall of coal and died on 21st October, 1903. A beam of wood, while being unloaded at a railway station by a carter employed at Little Mill Colliery, Ayrshire, fell upon him and inflicted fatal injuries. A miner got his finger scratched on 15th April in Bent Colliery, and he died on 5th May from blood poisoning.